Could Canada could slip into the same traps that hurt the U.S. economy in 2008-09? Some are sounding the alarm bells – at least on the housing front. Clearly, Ottawa is worried about the debt levels being carried by the average household. Witness Finance Minister Jim Flaherty’s recent announcement that he was changing the maximum amortization on a government-backed mortgage to 25 years from 30 years. The announcement was greeted with mixed reviews, including loud criticism from those who worry younger generations will have a significantly harder time being able to afford first homes. But reducing the limit for mortgage amortization is not only good public policy – cooling the speculative real-estate sector without killing the home-construction industry – it is good for homeowners in general. Here’s why. U.S. banks and lending institutions took part in two inappropriate activities in the U.S. housing and mortgage market prior to 2008, both passively allowed by the government in the hope of assisting low-income Americans to own their own homes. First, banks were offering mortgages with low introductory interest rates that would later (one to three years later) rise to higher ultimate rates. Second, banks were offering mortgages at very high ratios to the value of the house (even up to 100 per cent). This was all fine – for both banks and home owners – so long as incomes and house values rose. It all came to a thunderous halt in 2008. As homeowners’ mortgages with low introductory rates came up for renewal, many could not afford the new higher payments that went along with the higher ultimate rates. Americans had to walk away from their loans, and therefore, from their homes – in droves. At the same time, for those who had leveraged a very high percentage of their home value in their mortgage, the falling house prices meant that they now had a mortgage with an outstanding value that was larger than the value of the house. So, they too, simply walked away, handing the keys to their homes to the lending institutions. This all snowballed into the exponential fall in American home values in 2008-09, and the accompanying loss in value of the mortgage assets held by the lending institutions – a very important piece of the global financial crisis. In Canada, we are fortunate that our successive governments have always forced higher down payments for homes here than those required in the U.S. With the new limits on the amortization period, our government wants to dodge the American crisis. This is prudent, and safeguards the economy in general. But the new limits are also good for the individual home owner. Let’s do some arithmetic. Consider a $100,000 mortgage. (Most mortgages are much larger, but you can get to the answer to your personal situation easily by multiplying by the size of your mortgage.) I will assume today’s five-year mortgage rate of 5.24 per cent. If you take out a mortgage to be paid off over 30 years, your monthly payment will be $548.10. Over 30 years, you will pay a total of $197,316, including $97,316 in interest. If, however, you choose the 25-year mortgage, your monthly payment is $595.34 ($47.24 more a month). Over 25 years, you will pay a total of $178,602 – $78,602 in interest, just 80 per cent of the interest you would pay on the 30-year mortgage. Further, you will own the house debt-free five years sooner. If interest rates rise, the arithmetic becomes more dramatic. Consider a $500,000 mortgage at 6 per cent. If you choose the 30-year mortgage, you pay $2,974.12 a month for 30 years, a total of $1,070,683, including $570,683 in interest. Using a 25-year mortgage requires monthly payments of $3,199.03 ($224.91 more a month) for a total payment of $959,709, including $459,709 in interest. In other words, for an extra $7.39 a day, you can own your house five years sooner and pay a whopping $110, 974 less in interest. If a home buyer cannot afford an extra $7.39 a day in mortgage payments, should they be in the market? Aren’t we all really better off with the shorter amortization period? The bottom line: The impact of this new legislation is less pain than pragmatism. For once, we should be thankful to our big brother in Ottawa. 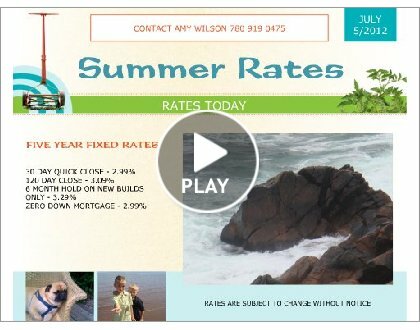 Contact Amy Wilson for your mortgage today!